Tess' story begins after a trip to Walt Disney World in December 2008. Having carried three young girls under 5 years old and their newborn baby brother around the theme park, we were all pretty tired. After a few days back home, everyone got their energy back except Tess. She continued to be bothered by aching legs and extreme fatigue. We knew something wasn’t right. After several rounds of tests, we received the devastating news that Tess had cancer. A few weeks later, we were on our way to Memphis and to Ronald McDonald House®. It would become our “home-away-from-home” over the next six months. Adjusting to life with childhood cancer and being away from home can be hard and frightening. It helps that at Ronald McDonald House® everything we need is provided. The community kitchens, dining rooms and common areas allow us to meet others who are dealing with similar worries. 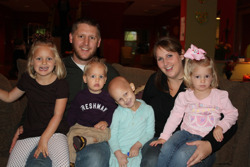 In the play areas, Tess can meet other kids who are also fighting cancer. She’s learned that she’s not alone and that she can still enjoy life like “normal” kids. I will always remember Ronald McDonald House® as a place that helped our family through a very difficult trial. The bonds we’ve made here give us the support and courage to continue helping Tess make it through another day.